Because we took our time writing our essays and with all the other events going on, we are going to do a rush through on World War I so we can get more U.S. history in before the end of the year. In this assignment, we will read the following readings as a class. Then you will answer questions on each reading. 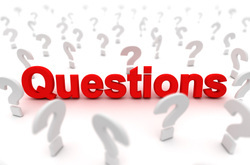 You may use your reading to answer the questions. When World War I began in 1914, it seemed like something far away. The war was between nations on the other side of the world, and the people of the United States were glad that it was so far away. We were content with things the way they were here and had no wish to become involved in Europe's war. Gradually that feeling of isolationism began to change. As early as 1915, an event occurred that brought the war to the attention of United States' citizens. That event was the sinking of the Lusitania. 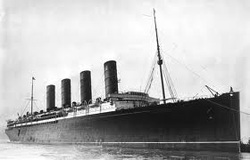 The Lusitania was a British ship that carried both cargo and passengers. It made the trip back and forth across the Atlantic Ocean, carrying travelers between Great Britain and the United States. Fast and luxurious, the Lusitania was a popular ship; it had been described as a floating palace. In May 1915, the Lusitania was crossing the Atlantic Ocean. In addition to about 2,000 passengers, it was also carrying a cargo of ammunition for the Allies. 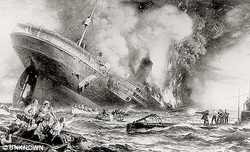 On May 7, German submarines torpedoed the Lusitania. In twenty minutes, the Lusitania was gone, sunk to the bottom of the ocean. About 1,200 passengers went down with the ship, including many Americans. After that, U.S. citizens began to think of Germany as a "bully" and wanted to side with the Allies. Germany made promises not to sink ships without first giving a warning so that passengers could leave the ship. However, this was wartime, and Germany did not always keep its promises. Then, Germany began to blockade Great Britain, attacking more and more ships. These attacks caused problems for the U.S. economy. It made it difficult for U.S. businesses to make money. Businesses needed to be able to travel freely on the seas to deal with foreign countries, especially Great Britain. Government officials in the United States began to think that maybe the U.S. would have to enter the war to protect its own interests. They began to try to change people's minds about the war. The government began a propaganda campaign which included parades in support of the Allies and leaflets that pictured the Germans as fierce barbarians. They also began to build up the number of troops in the Army, the Navy, and the Reserves. They began building more Navy ships. A National Security Committee was formed. While all of this was going on, many Americans still hoped to stay out of the war. President Wilson still hoped for the United States to remain neutral. He did not want the U.S. to be pulled into the war. In a speech, he said, "There is such a thing as a man being too proud to fight." Then, on January 16, 1917, another event occurred that brought us even closer to war. Great Britain showed the United States a telegram that it had intercepted and decoded. The telegram was from the German Foreign Minister, Arthur Zimmerman, to the German Ambassador in the United States. The telegram said that he should invite Mexico to join an alliance with Germany. The telegram said that if Mexico joined the alliance, Germany would help it win back Texas, New Mexico, and Arizona from the United States. The war had come closer to home. Germany continued its submarine attacks against U.S. ships. Our economy and our independence on the seas were threatened. Finally, President Wilson felt that he had no other choice. He decided that the U.S. should enter the war. Many reasons had led up to his decision, but he wanted to give the American people one good reason to support the war. So he only said, "The world must be made safe for democracy," when he declared war on April 6, 1917. Click on the icon to the right to answer the questions on today's reading, The U.S. Enters the War. You may also take the embedded version below. You will get your score back immediately. You can take this twice. I will take your highest score. World War I took place in Europe. 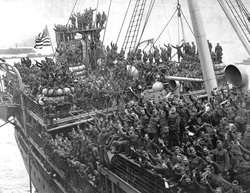 When young men from the United States volunteered or were drafted to fight in the war, they crossed the Atlantic Ocean. There, in Europe, they took part in the battles. People said that they were at "the front." Here at home in the United States, there wasn't much that people could do at first but hope and pray that their loved ones would come home safely. Then, when the chance came along to do something that might help the soldiers overseas, people were glad to participate. It made them feel like they were doing something to help their sons and husbands who were on the front lines. Soon, the United States was asking its citizens at home to help in many ways. At home, on the farm, and in the factory, people were making changes in their lives to support the war. Some of the changes were legislated by the government, but others were made voluntarily. Propaganda posters convinced people that volunteering was the right thing to do. One poster said "Women! Help America's sons win the war." Another one called on people at home to show "The Spirit of America" by volunteering in the war effort. 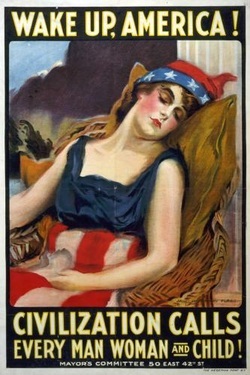 These efforts to support the war from here in the United States became known as the home front. One large part of the war effort at home involved food. The government needed huge amounts of food to feed the millions of troops in the military. It asked citizens at home to give up eating certain foods on certain days so that there would be more food to send to the soldiers. Americans observed "wheatless" Mondays, "meatless" Tuesdays, and so on. Families were encouraged to eat all of their leftovers so that nothing would be wasted. They were also encouraged to grow vegetables in little gardens at their homes. These were called "victory gardens." The government encouraged farmers to increase the size of their crops, too, so that there would be more food to send overseas. Since many of the male farmers were already in the army, farm women took on much of this work. Citizens at home were also encouraged to support the war by providing money. One way they did this was by buying war bonds. When people bought war bonds, it was like putting money into a savings account except that the money went to the government instead of into a bank. The government could then spend the money on war expenses. Millions of Americans bought these liberty bonds. Another way that people supported the war with their money was by paying higher income taxes. Factory workers supported the war by producing rifles, bullets, artillery shells, and other materials. They also built ships for the rapidly growing U.S. Navy. As on the farms, many of these jobs were filled by women. The War Industries Board made sure that factories kept producing war materials. 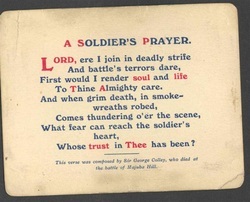 A popular slogan said that people should be supporting the war one way or another. They should either "work or fight." By providing all of this food, money, and materials, citizens at home supported the war. They provided the army with the things that it needed to keep fighting. Click on the icon to the left to answer the questions on today's reading, The Home Front. You may also take the embedded version below. Click on the blue game names below to play any of the arcade games. President Woodrow Wilson was planning a speech to give to Congress. This would be a speech to a joint session of Congress, which meant that members of both the Senate and the House of Representatives would be there. Like all modern presidents, President Wilson had experts to help him decide just what to say in his speech, but this one still must have taken a lot of thought. The speech that President Wilson was preparing to make on January 8, 1918, would be his plan for ending World War I. Wilson had not wanted to enter the war in the first place, but world events had eventually brought the United States into the war. Now that the war was ending, he hoped for an agreement that would provide world peace in the future. He wanted a plan that would save the world from ever having another world war. In his speech, Wilson said that "the peoples of the world are partners." He even said that Germany, our enemy in the war, should be treated with fairness and respect. He said, "We wish her (Germany) only to accept a place of equality among the peoples of the world." what to do with the lands that were claimed by more than one country. There were points about how to deal with Germany and the other defeated countries. There were also points aimed at avoiding future wars. Point one said that the peace agreements should be held in the open; there should be no secret deals. Point two said that all countries should have freedom to sail the seas. Point three called for open trade between nations. Point four called for arms reduction. Points five through thirteen dealt with the way in which claims to land would be settled. They called for a breakup of the large empires and for allowing groups of people to decide on the futures of their own countries. Point fourteen called for the formation of the League of Nations. This would be an international organization that would settle disputes, so that those disputes would not escalate into wars. One thing that Wilson's plan did not call for was punishment. His plan would not treat the defeated countries harshly. Wilson felt that this was an important step toward peace in the future. His plan was one that he felt was fair for all of the countries involved; it was not only what was best for the United States. As Wilson said, "Unless justice is done to others, it will not be done to us." For now, President Wilson was only presenting his speech to the United States Congress. Eventually, when it was time for the peace conference, he hoped to present this plan to all of the countries that had been involved in World War I. He also hoped that all of the countries would accept his plan. Finally, he hoped that there would never be another world war. Click on the icon to the left to answer the questions on today's reading, Wilson's Fourteen Points. You may also take the embedded version below. What happens when a war is finished? Does everyone just go home and go back to what they were doing before the war? What happens to the countries that have been defeated? What happens to the lands that have been destroyed by the fighting? What happens to the conflicts that still haven't been settled between the two sides? Should something be done to prevent another war from beginning? At the end of World War I, President Wilson and the leaders of the other victorious countries decided to meet and make some important decisions about issues like these. Their meeting was called the Paris Peace Conference. It began in January 1919 and lasted for months. The conference took place in a palace called Versailles, just outside of Paris, France. It was a large conference, and lots of different meetings took place during the conference. The main meetings took place in a large, beautiful room called the Hall of Mirrors. The Hall of Mirrors had 70 windows, and across from the row of windows there was a row of mirrors that reflected the view. Green marble pillars added to the formal look of the room. Representatives from 32 countries took part in the conference. The countries that were defeated in the war, including Germany, were not invited. Some countries were allowed only one representative, and others were allowed more. The United States and the other major powers from the war had five representatives. When all of the countries met at once it was called a plenary session, and all of the members voted. Many decisions, however, were made by a smaller group of only the most powerful countries. This group was called the Supreme Council. Even among the Supreme Council, some countries had more power than others did. Four countries, known as the Big Four, dominated the decision-making. The Big Four countries were the United States, Great Britain, France, and Italy. They were represented by President Wilson of the United States, Prime Minister David Lloyd George of Great Britain, Prime Minister Georges Clemenceau of France, and Prime Minister Vittorio Orlando of Italy. Each of these leaders wanted to settle the problems caused by the war, but each one also wanted what seemed best for his own country. President Wilson had already outlined his plan, which was known as his Fourteen Points. His plan called for breaking up the large empires, settling the conflicting claims for land, and establishing a League of Nations to settle future conflicts in order to prevent future wars. It did not call for punishments for the losing countries. 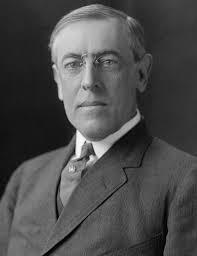 Back in the United States, some people disagreed with Wilson's idea of a League of Nations because they feared that any type of alliance could eventually get us involved in another conflict. Instead, these people wanted to keep us out of European affairs all together. The three European prime ministers had a different view of what should happen at the peace conference too. Their countries had been more directly involved in the war than the United States, since the war had been fought in Europe. Much of their land had been ruined, their cities had been destroyed, and innocent citizens in their countries had been killed. They wanted to make sure that Germany never became powerful enough to invade their countries again. Many of the people in their countries felt that Germany, and the other Central Powers, should pay for the billions of dollars in damages caused by the war. Many people felt that the Central Powers should be punished for going to war. Once the conference began, there were plenty of issues discussed and many decisions made. Click on the icon to the right to answer the questions on today's reading, The Paris Peace Conference. You may also take the embedded version below. When President Woodrow Wilson and the other world leaders met at the Paris Peace Conference, they had many important decisions to make. If they made the best possible decisions, maybe the world would stay at peace for a long time to come. If not, conflicts could begin again that might lead to another war. 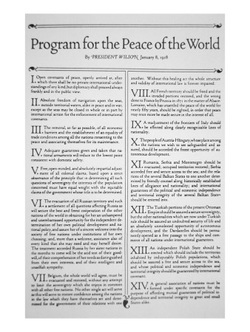 President Wilson had a plan in mind, called the Fourteen Points, that he thought would lead to world peace. Other people still had their minds more on the conflicts of World War I. There were still conflicting claims to land that had to be settled. European countries needed billions of dollars to repair the damage done by the war. Countries that had been invaded by Germany wanted to be sure that it would not happen again. Some people felt that the country of Germany should be punished for starting the war. The leaders at the peace conference discussed and argued and finally came up with some plans. They created several treaties, each one dealing with one of the defeated Central Powers. The main one was the treaty with Germany called the Treaty of Versailles. 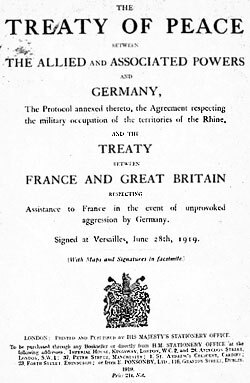 The Treaty of Versailles blamed Germany for the war, and its provisions were very harsh for Germany. Germany was ordered to reduce its military to a small part of what it had been before the war. The size of its army would have to be reduced to 100,000 men. It was not allowed to have tanks, heavy artillery, military aircraft, or submarines. Germany was also ordered to pay huge amounts of reparations, or payments for war damages. Germany lost territory too. Parts of Germany were combined with parts of other countries to form Poland and Czechoslovakia. The provisions of the treaty, if followed, would leave Germany a weak country. Other parts of the treaty divided Austria-Hungary and the Ottoman Empire, which would be dealt with further in later treaties. The Treaty of Versailles also set up the League of Nations, which had been one of President Wilson's suggestions. Its purpose was to settle disputes between countries and prevent future wars. However, Germany and other Central Powers were not admitted to the League of Nations. The United States Congress voted against the League of Nations, so the United States did not join either. The League of Nations would be based in Geneva, Switzerland, a neutral nation in World War I and in many other wars. It would be authorized to call in nations when they were having a dispute, and attempt to settle the problem. If the nations could not agree on a solution, the League of Nations could apply sanctions, or punishments. The smallest sanction was a warning. Next came economic sanctions, which meant that a country's trade could be cut off. The most severe sanction would be the use of military force. However, since the League of Nations did not have its own military, and no other countries were in a position to support it with their own military forces after the war, this provision could not really be used. There were problems with the parts of the treaty regarding Germany too. German citizens were very unhappy with the treaty, and felt that their country had been treated unfairly. At first, Germany did do what many of the treaty's provisions called for, but not everything. Then, with the rise of the Nazi party in the 1930's, it began to ignore the treaty all together. Germany began to once again build up its military power, and it refused to pay reparations. Some historians say the treaty was too harsh, and that it led to the popularity of the Nazi dictator Adolf Hitler in Germany. They say that, in this way, the peace treaty of World War I became one of the causes of World War II. Click on the icon to the right to answer the questions on today's reading, The Treaty of Versailles. You may also take the embedded version below. Drag each statement into the correct category regarding the Treaty of Versailles.